Join us for a 55th Anniversary Screening on October 22! This entry was posted in Blog, Boycotter Stories on October 11, 2018 by '63 Boycott. In honor of the 55th year since the 1963 CPS student boycott, join Metropolitan Planning Council and Kartemquin Films for a special screening. We will host an after-film panel discussion on the boycott and present-day activism driving racial equity in education. Panelists include Producer Tracye Matthews, a student activist and Pemon Rami, a film producer/director and organizer of the 1968 CPS student walkout. WBEZ Reporter Sarah Karp will moderate the discussion. Director Gordon Quinn will give opening remarks. 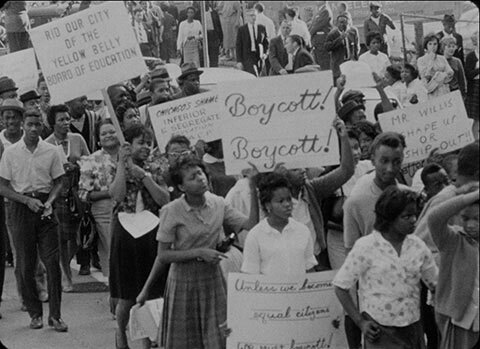 October 22, 2018, 5 to 7 p.m.
On October 22, 1963, more than 250,000 students boycotted the Chicago Public Schools (CPS) to protest racial segregation. Many marched through the city calling for the resignation of School Superintendent Benjamin Willis, who placed trailers, dubbed ‘Willis Wagons,’ on playgrounds and parking lots of overcrowded black schools rather than let them enroll in nearby white schools. Blending unseen 16mm footage of the march shot by Kartemquin founder Gordon Quinn with the participants’ reflections today, ’63 Boycott connects the forgotten story of one of the largest northern civil rights demonstrations to contemporary issues around race, education, school closings, and youth activism.